Last Friday, Amy Adams’s red dress in Paris was the Outfit of the Week. It was her best dress of this award season. And I was surprised. Because the dress was so good, so much better than anything she’s worn on any carpet this year, that I wondered how her BAFTA dress could be better. And since the BAFTAs are a bigger deal than the premiere she was at, it should be better. That’s the work behind choosing the award season wardrobe. You select and edit for the occasions. You hold back for the bigger splash. Unfortunately this didn’t happen at the BAFTAs. Because it’s not ever going to happen with taffeta. At least not taffeta that’s presented so conventionally. 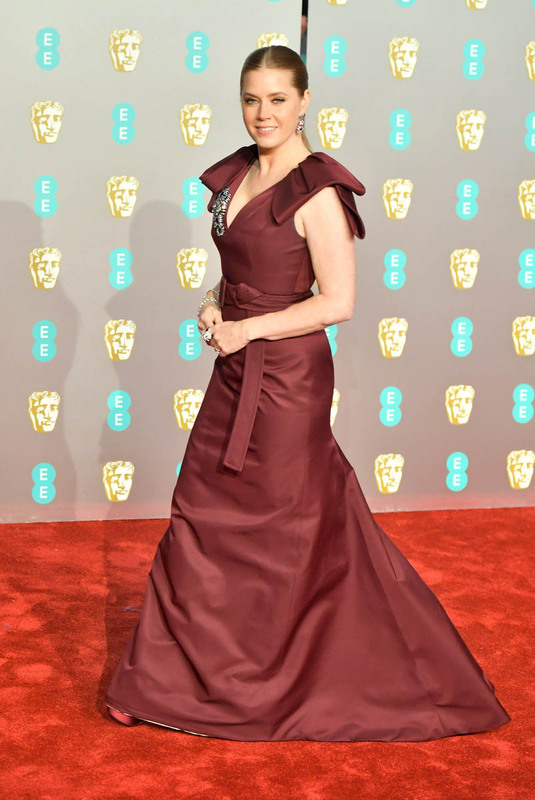 I understand why she and her style team went with the taffeta at the BAFTAs – because people think taffeta is “fancier”, more formal. What good is fancy and formal though when it’s not actually that sophisticated? The bunching and folding and creasing isn’t elegant, not to me. And it’s just so BORING when it’s cut as a column. There’s nothing to it. It’s just yards of material that doesn’t move well, that doesn’t swing or flow, it’s stiff and unimaginative, and even with that shoulder detail, everything just seems so underwhelming in that colour. So… we swing in the opposite direction now. This was the second best dress. The best dress is for Oscar. Come through for the Oscars, Amy, COME THROUGH.